The common name of this prairie plant comes from the presence of tiny hairs that give it a whitish appearance. 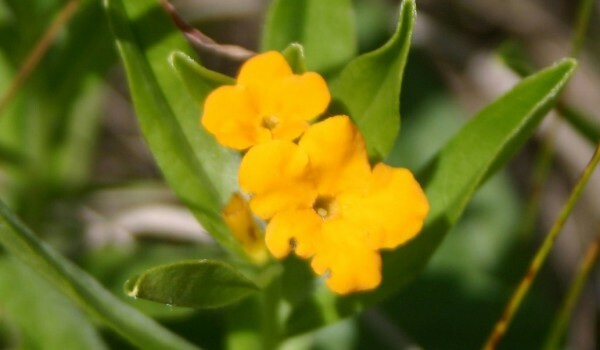 Indigenous peoples once used Hoary Puccoon as a source of reddish dye used for colouring pottery, baskets, and personal ornaments. The flowers have no noticeable scent, but do provide nectar for long-tongued butterflies and bees in the spring time. Not rare. Listed as “sensitive” in Ontario. 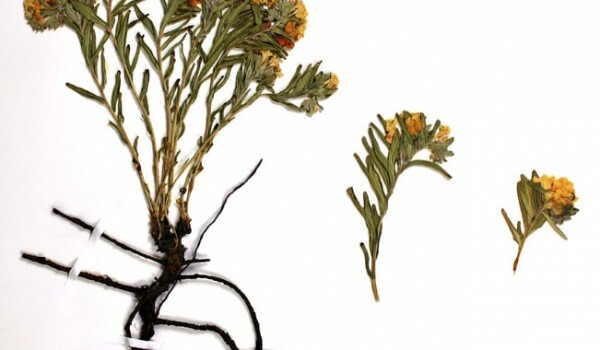 This perennial plant has a stout taproot and grows to 40 cm tall. Its 5-9, erect, occasionally branched stems are covered in white hairs. The alternate leaves are bright green, hairy and oval-shaped with pointed tips. Flowers are small and tube-shaped, with five rounded lobes extending outwards. These occur in 1-3 dense, curving clusters, in which the endmost flower blooms first. Fruits are small yellowish-white nuts, each containing a single seed. Seeds and/or plants may be available from greenhouses and seed supply companies specializing in native plants. 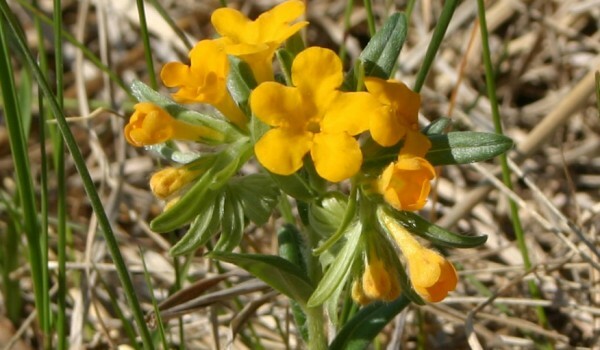 Hoary Puccoon is difficult to germinate from seed, but may be easier from transplants.